In a large, shallow bowl, combine the eggs, salt, garlic powder and milk and set aside. Place the flour and breadcrumbs in two separate plates. Pour enough vegetable oil in a large frying pan to be about 1” deep and place over medium high heat. Cut the steak in 4 – 6 equal pieces. Dredge each piece of meat in the flour then the egg mixture, then finally through the breadcrumbs. When the oil is preheated to medium high, place each piece of steak into the hot oil (steak should immediately sizzle when it is dipped into the oil). Test by dropping in a few crumbs; if they sizzle, the oil is hot (about 375). 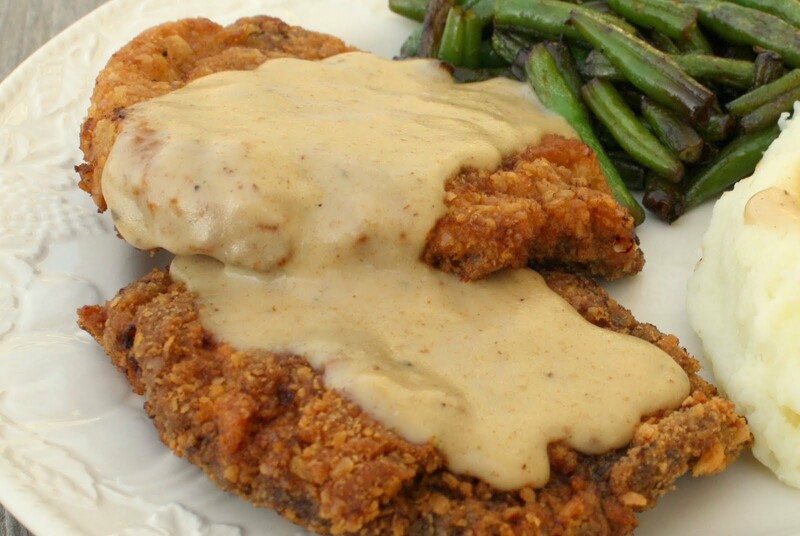 Cover and cook breaded steak on each side for approximately 6 minutes or until it is a golden brown. Drain on a triple thickness of kitchen roll. Transfer to an ovenproof dish and keep warm in the oven until ready to serve. Heat drippings or oil in a frying pan to medium. Sprinkle flour over hot oil one tablespoon at a time, whisking well until a smooth paste is formed. Combine milk and water in a medium size jug. Now, whisking constantly, slowly add milk mixture and then the soup base or bouillon. Bring the mixture to a slow boil (adjusting temperature if necessary), continuing to whisk constantly and cook for 1 – 2 minutes. Add salt and pepper to taste and serve immediately. Gravy should be coat the back of a spoon when done. If not, simmer, uncovered to reduce for a thicker consistency or, add more milk or water for a thinner consistency.